Come check out this affordable cul de sac cutie!Extra long driveway for lots of parking! 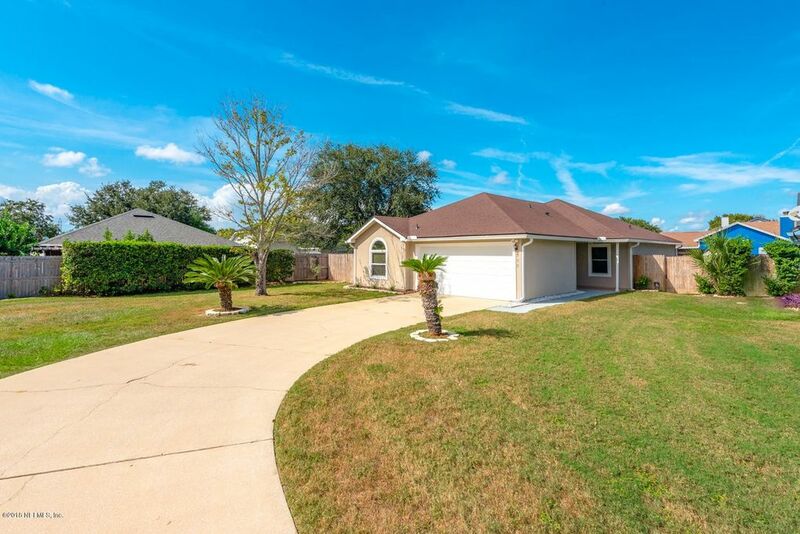 Good sized fenced yard w/shed & room for pool!Villas of Cross Creek is tucked away from the hustle & bustle yet minutes from A-rated elementary schools, shopping, dining, beaches, NS Mayport & St Johns Town center! Step into foyer which leads to large living area & dining room.Space for large sectional couch if you need it!Fully equipped kitchen w/granite counters overlooks breakfast nook & additional living area...so one area for kiddos & one for Mom & Dad!Screened porch w/vinyl windows overlooks backyard.Split floorplan arrangement. Some features of this home-roof 2018, windows 2016, HVAC 2018, Siding-Hardiboard Stucco panels, 1 yr HOW 2-10 $540, tile & parquet flooring & transferable termite bond! Directions: From Atlantic Blvd, head north on Kernan Blvd, t/r Mastin Cove Rd., t/r Silent Brook Trl which becomes Sondra Cove Trl W, t/l left on Carriann Cove Ct., house on cul de sac on left.